b. 25 July 1856 Mechanicsburg, Sangamon Co. IL. m. Charles Rufus PERKINS, Feb. 11, 1880, Source: Sangamon Co. IL Marriage index, "Kate" page 88. Kate is listed as being 23 and of Mechanicsburg, IL and Charles as being 37 of Woodside township, Sangamon Co. IL. Also see Sangamon Co. Marriage index Vol 5, page 275. Another source (LDS 2034506) give the same date, but in Pasadena , Los Angeles, CA. while yet another source LDS 457452 give IL. IL is correct./// LDS film 445046 ( R. = Rufus). b. 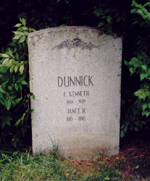 9 September 1842 Springfield, IL, the son of Robert Lucien and Harriet Emmaline (BONE) PERKINS. Charles is listed at 37 when he wed in Feb. 1880. As a youth, Charles lived in Menard County, IL. His mother, Harriet must have died. In 1853 his father remarried to Emma. Charles' siblings were Frances Jane b. 1844, Thomas M. b. ca 1847, and E.E. b.1849 or 50 but is missing in the 1860 census. Charles, age 27, single Bookkeeper // Robert 17 // Margaret 13, all b. IL. 1920 Katherine living with son Charles, he is a Single man, bookkeeper. in Jones County, Mississippi She is 53 - widow Robert age 17 and Margaret 13 are both still in the household. descendancy chart see last entry. b. 17 Mar 1881 - d. May 1972 per SSDI - of Elkhart, IN - only Charles Wyland listed in Indiana. 1930 Census for South Bend, St. Joseph Co., IN lists Samuel, age 69 living with "Catherine" Wyland, age 27 divorced. Bank Clerk. She was 19 when they wed.
1910 -6 April 1986 Franklin Co. OH. obit of mother publ. Dec. 2, 1962 in The Columbus Dispatch. Photo donated by Wendy Marcum-Leary. Unclear who Frances CARVER is. Press Gazette, Hillsboro, OH publ December 28, 1943 lists Corp and Mrs. Ray Dodridge as Dinner guests of Mr. and Mrs. George Dunnick, other guests Lena DUNNICK, & Mr. and Mrs. Kenneth DUNNICK. 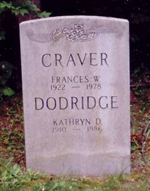 No where after that date do I find mention of Ray Dodridge, just Mrs.Kathryn Dodridge. It seems that Kathryn and her sister Mrs. Carver were often together -- wonder if both lost their husbands early in life. Press Gazette, Hillsboro, OH Nov. 24, 1967 family celebrated Mrs. Kathryn Dodridge's birthday. WWII draft registrations: A Raymond C. Dodridge of Columbus, OH enlisted Dec. 19. 1942, Married. 2 years college, Photographer, retouch artist. b. 1911. There is also a Raymond C. that was born about 1912 that died in Akron, OH on 27 August 1977. Kenneth was a teacher in 1942 in Columbus, OH. Source: 1910 Columbus, Franklin Co. OH// obit of mother publ. Dec. 2, 1962 in The Columbus Dispatch. named principal of Edwardsburg High School. Was teaching Physics, Chemistry and Advanced math. Graduate of Manchester College and M.A. from Indiana Univ. Source: South Bend Tribune, May 7, 1958 "Dunnock Gets School Post" donated by N.G.Dunnuck. b. circa 1903 in CO.
Keturah wrote her will December 27, 1860. 1860 census for Pleasant twp., Madison County Ohio lists Keturah as a 70 year old seamstress, b. in MD. 1830 census lists his age as 40-50 yrs old. Mother, Catharine's will written 1834 had "Kiturah Koffelt wife of George Koffelt deceased"
Father, John's will written 1819 had "daughter Ketuash Kauffelth" also later in the will "deed conveyed to the testator by George Caufelt and wife Katurah, I request same returned to them" Note: both spellings in the will. Lucinda (wife of Frederick Young) Frederich mentioned by name in her will. Source: Will of John DUNNUCK-1819 & Mother, Catherine DUNNUCK's will-1836// 1830 census and Will of Keturah donated by Brian Clarridge // Tombstone information from Brian Clarridge. 1850 census, for Walnut township, Pickaway Co. Ohio, lists a John E. Morgan age 55, b. VA (in circa 1795). There is no wife, but with him is a 16 year old female Adeline P. Morgan b. OH. and another female child, 9 year old Angeline Thompson b. OH. Wonder if this is the same John Morgan?